I have been a fan of THIERRY MUGLER’s Angel perfume for many, many years. It’s proven itself to be a timeless fragrance. The signature silver star top and crystal bottle makes a statement on your dresser, but was always hard to hide in a small purse. Now they’ve made it easier to make this dreamy fragrance portable. In case you’ve never tried it, let me tempt you with the ingredients: Honey, Vanilla, Chocolate and Caramel with a top note of Patchouli. Fab! I’m always on the hunt for the latest sensational scent. And if it’s in the oil form? All the better as they seem to last longer on the skin. 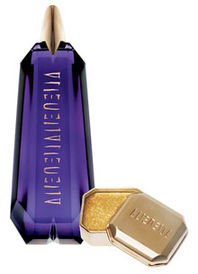 The new Alien by THIERRY MUGLER “Prodigy” Ritual Oil ($67/4.2oz @ nordstrom.com) is described as modern amber so it’s warm and woody with a surprising splash of floral that works. The amethyst bottle is shaped like a faceted stone and kinda looks like something you’d find in a spaceship! And each bottle also comes with a .2oz Luminous Body Shimmer to help you really get you “night” on.